﻿﻿ June 2018 home sales continued its momentum, but just fell short of last year’s levels, down – 0.99 % compared to June a year ago. Home sales this month were 2,798 compared to 2,826 in June 2017. 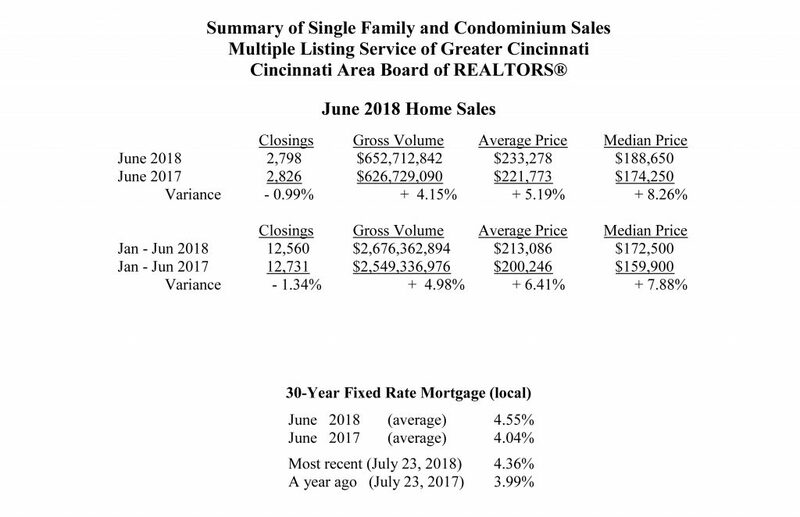 “June 2018 recorded the fourth highest June home sales since 2005, the highest recorded in June 2005,” said Phil Morrical III, President of the Cincinnati Area Board of REALTORS®. “Home sales remain very strong as a result of the strong economy. Even though interest rates are rising slowly, the demand for housing has not subsided,” said Morrical. The June average home price climbed to $233,278 compared to $221,773 a year earlier, a + 5.19 % increase. At the same time, the inventory of homes for sale, as of June 30, continued its year-over-year declining trend to 4,986 from 5,458 a year ago, down – 8.65 %. “Homes in greater Cincinnati are very affordable despite the fact we are dealing with low inventory and increasing home prices. Homes priced right and in move-in condition are selling quickly,” said Morrical. “Use a Realtor to assist you in selling your current home or buying your next home. Realtors have access to the MLS of Greater Cincinnati, the most powerful tool used by Realtors to assist you in listing and / or selling your home quickly, efficiently and for the best, possible price,” said Morrical. Local home mortgage rates in June averaged 4.55% for a 30-year fixed rate loan. The rates were up compared to 4.04% a year ago. At these fixed rates, the monthly principal and interest payment on a $100,000 home loan with no money down would be approximately $510. “REALTOR’s are available to help guide consumers through all the important details involved in buying and selling a home. A REALTOR will assist them through the entire process and is your absolute best source for professional and accurate information,” said Morrical. Nationwide, June home sales were down – 0.6% from May on a seasonally adjusted basis, and were down -2.2% from June 2017. CLICK HERE for a PDF Version of this press release.